Elsie is Nelly’s daughter from her first litter. She is a very loving , extremely affectionate little girl. 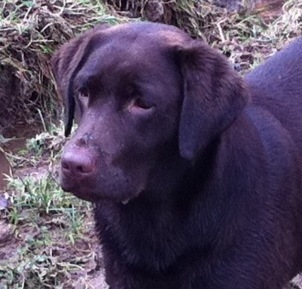 She has a dark chocolate coat, good eye colour, an amazing otter tail and good conformation. She has been shown at both open & championship shows and has had some nice placings. She has also had gundog training which she thoroughly enjoys,which helped & improved he obdeience , though we never worked her.Elsie had her first litter of puppies spring 2013 and proved to be a caring & loving mother to her 9 black / chocolate brood. 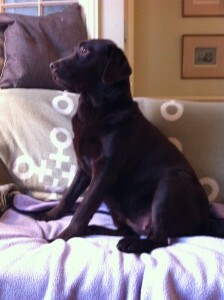 All her pups went to loving family homes & some have plans to gundog train when older. We have kept Gracie , a little black girl from this litter & are very much looking forward to her future.